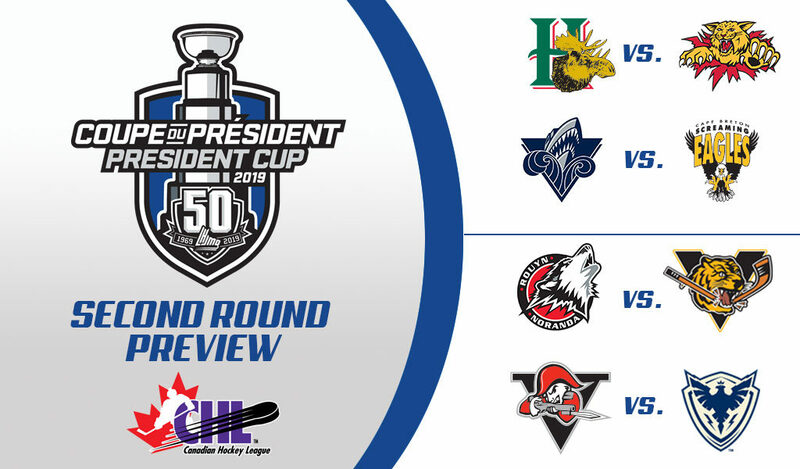 The Mooseheads got a first-round scare after being pushed to seven games by the eighth-seed Remparts, and will surely look to make quicker work in their second-round series versus the Wildcats. Still, Moncton advanced to the second round after upsetting the second-place Drakkar in seven games, with goaltender Francis Leclerc playing a big part in the series. In all, he allowed just 17 goals across seven games to come up with a spectacular .932 percentage that ranks first among all playoff netminders. The second round could set up a goaltending showdown versus the Mooseheads’ Alexis Gravel, as the Chicago Blackhawks up-and-comer came up with four wins in the opening round, while allowing only two goals combined in his past two outings. He’ll be tested by Wildcats forwards Jeremy McKenna and Mika Cyr, who finished with 11 and 10 points, respectively, in the opening round. 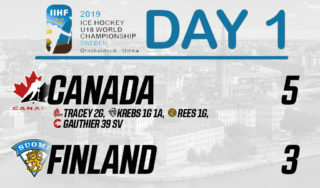 The Mooseheads will look to reply with 2019 NHL Draft prospect Raphael Lavoie, who put up seven goals and six assists for 13 points in the quarter-final to sit tied for top spot in playoff scoring league-wide. 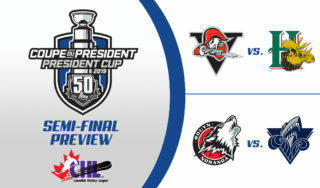 The Oceanic and Screaming Eagles will face off in the second round, their first meetup since a home-and-home series in October that saw Cape Breton take both games. Now in the second round, the Screaming Eagles are led by netminder Kevin Mandolese, as the Ottawa Senators prospect stole the show in the quarter-final versus Charlottetown after allowing just 16 goals over six games while coming up with a .919 save percentage. Up front, right-wing Mitchell Balmas kept up his scoring touch from the regular season as he wrapped up the quarter-final with 11 points to sit tied for second in league playoff scoring. Meanwhile, the Oceanic bring 2020 NHL Draft hopeful Alexis Lafreniere, who after finishing tied for second in regular-season scoring notched eight points in the opening round versus the Sagueneens, a total matched by teammate and overage forward Jimmy Huntington. Between the pipes, the Oceanic boast solid goaltending of their own in draft-eligible Colten Ellis, who allowed just 11 goals in his team’s sweep of Chicoutimi. The Huskies have their sights set on a Memorial Cup, a road that now goes through a second-round series versus the Tigres after taking six games to knock off the 33-point Cataractes in the opening round. That series saw Jean Beliveau Trophy winner Peter Abbandonato continue to light the lamp as he recorded two goals and 11 assists for 13 points to sit tied for top spot in league playoff scoring. Meanwhile, New York Islanders first rounder and defenceman Noah Dobson, who captured the Memorial Cup last year with the Acadie-Bathurst Titan, upped his game in providing plenty of offense from the back end as he wrapped up the first round with two goals and eight assists. The team also got strong support between the pipes from Samuel Harvey as he allowed just 11 goals over six games while also recording a shutout. 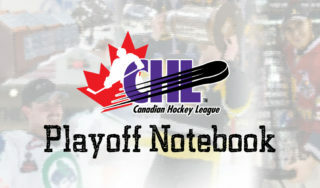 The second round will see Harvey tested by the Tigres’ Simon Lafrance, who finished with nine points in the opening round, a total matched by blue-liner Dominic Cormier, who collected two game-winning goals in the quarter-final. 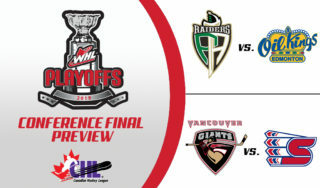 After sweeping the season series versus the Phoenix, the Voltigeurs will hope for a similar outcome in the second round of the postseason. Drummondville is led by Detroit Red Wings first-round pick Joseph Veleno, who put up five goals and four assists for nine points in the opening round, while the team is also getting offensive support from a handful of others, including crafty forward Maxime Comtois, who potted four goals in five opening-round games. Meanwhile, the Phoenix are led by 2019 NHL Draft hopeful Samuel Poulin, who matched Veleno’s totals in the first round, while the team also saw strong play from netminder Dakota Lund-Cornish, who allowed just 10 goals in five appearances in the quarter-final to go with a .925 save percentage. As for the Voltigeurs, the team was one of the stingiest defensively during the regular season and kept up that performance in the first round versus the Olympiques as goaltender Anthony Morrone stepped up in place of the injured Olivier Rodrigue in coming up with four wins and an .890 save rate in five appearances.